Here at action mapping central, we’re all about scenarios — realistic activities that help people practice what they need to do on the job. I say that yes, we can throw them into an activity that requires knowledge that they don’t yet have. The trick is to make that knowledge available for them to draw on as they need it. Let’s consider the plight of people in the US, the land of feet and inches. When calculating building supplies, Americans often need to add fractions. Our learners are American construction workers or similar people who often need to figure out the total length of two boards. We’re designing elearning. Let’s try it a different way. Let’s make me one of the learners. Math was not my best subject. I’m plunged into an activity that requires me to figure out the total length of a 5-foot, 2 1/2″ board plus a 3-foot, 4 3/8″ board. I’m trying to determine if I can put them end-to-end to get the length required for my porch deck. I realize I have no clue how to calculate the total length. I click the optional link called “How to add fractions.” I see a quick tutorial on how to do it in general. If I had remembered anything from math class, this tutorial probably would have been enough for me. I apply what I learned in the tutorial to the problem, but I’m not sure I’m doing it right. The answer I got is one of the options, but something seems wrong about it. I click the other link, called “See how to solve it.” This shows me the first step to solving the problem and then displays a “Next” link, giving me the option to see the next step. When I click “Next,” I see the next step, and I finally understand what I need to do. I go back to the problem and solve it. If I didn’t get it after seeing the first two steps, I could have kept clicking until I saw all the steps and the actual solution. The course also offers a downloadable, printable job aid that includes a quick reminder of how to add fractions, so I can look at it on the job. ​This is a very different way of “teaching” stuff. Its advantage over “tell, show, do” is that it puts control in the learner’s hands. People who already know how to add fractions simply complete the activity and move along quickly, while people like me who don’t know the method stop, learn it, and then apply it. ​Since this is self-paced elearning, we could adapt it to the learner. If someone views the support materials before solving the first fraction-adding problem, we schedule another fraction-adding problem for them (and maybe another and another, depending on how they seem to perform). In contrast, the people who solve the first problem without help move on immediately to a different type of activity, because they’ve shown that they can already add fractions. Each person gauges for themselves how much they know, seeing and filling their own knowledge gaps. Everyone goes at their own pace, digging deep into the how-to material or skipping it. No one has to sit through a presentation about stuff they already know. And, importantly, the designer shows that they respect the learners as functioning adults with life experience. For a lot more about that, see the recording of our recent webinar on motivation. For research that supports this approach, see my post Throw them in the deep end and the FAQ Where’s the research support for scenarios? There are still seats available in the scenario design course that starts on Feb. 6. Learn to design scenarios by designing scenarios, with personal feedback from me. Sign up here. Tank you Cathy for this topic. Now a question. What if the purpose is to acquire the concept by itself not knowing at first what the use of it will be. Say : we want to teach the basis of legislation dealing with illegal labor. There are a lot of diferents laws to know, how they are implemented, by whom, with what power ? The implementation will be quite diferent from a learner to another one. We cannot design any activity that would suit each one or cover the “program”. What do we do ? Bruno, thanks for your question. If I were a designer in that situation, I’d question the assumption that everyone must be taught the concept through training materials. For example, if the organization has a written policy on how to handle illegal labor, they could first require everyone to read it. If people read the policy but make mistakes when hiring, maybe the policy could be clarified and distributed again. If people still make mistakes and the policy can’t be made any more clear, then training might help. However, that training would be most useful if it focused on the mistakes people are making, not on the history of the laws or who is in charge of them. If the audience is broad, it can be helpful to divide the learners into general categories and write activities for those categories. For example, people who make hiring decisions will see different activities than people who need to recognize when an outsourcing firm might be violating the law. The point is to identify WHY people need to know the concepts — what are the mistakes they’re making that affect the performance or legal standing of the organization? Then design activities to help them avoid making those specific mistakes. The focus is on having people practice making decisions using the concepts, not just on absorbing the concepts. I hope that helps. Bravo Cathy! 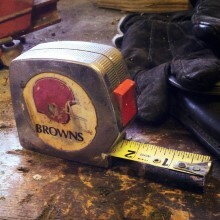 By the way I love your Cleveland Browns Tape Measure. Can I please ask where you got it!!!?? Cathy, I agree that not everything needs to be “taught.” Reading is a form of teaching (for those who learn best via that method). I also agree that overt training works best when it’s directed towards correcting problematic behaviors or performance. I would suggest that analyzing “…WHY people need to know the concept…” and analyzing what mistakes they are making and WHY are two different things, however. While it might be true that I don’t have to understand the concept of time to be able to fix a watch, I do have to understand how a watch works to be able to fix it, especially when it’s necessary to diagnose an unknown cause. I might suggest, Bruno, that you also look at Ruth C. Clark’s Developing Technical Training, which discusses the differences designing for and teaching five content areas – facts, concepts, processes, procedures, and principles. In the book, she touches upon how each content type can be taught at the knowledge/remember, understand/comprehend, and application levels of Bloom’s. I think that would be helpful for you in using the information Cathy provided in the second paragraph of her response. And it’s useful to have a working level understanding of learning styles…as both you and Cathy pointed out, no one single method will be effective for all learners, and it may be necessary to create materials that address different styles. After all, we care less about HOW someone acquired knowledge than we do that they can properly USE that knowledge when needed. Great piece. I will apply the logic immediately on a project that I’m working on. While I’ve been a proponent of this concept for years, I find it hard to convince client and colleague that it works, without dragging all learners down a prescribed path. Old dogs, new tricks. Thanks Cathy! As a 20 year season ticket holder the picture caught my eye. Perhaps a quicker way to find out whether someone can add fractions is just to ask. Alternatively, there’s a free app which you use like a calculator to add fractions ‘Fraction Calculator’. Great topic Cathy – it is one that gets a lot of push back, especially in STEM teaching online! Had a recent course where I needed to explain a four line long ‘definition’ of validation in a pharma production environment. I created a scenario where a new employee is asked ‘can you quickly handle the validation of this new machine?’ and had him ask a bunch of colleagues to tell him what they thought was needed. Learner than has to choose who they think is giving a valid point, who not. After that, the chosen info is collated and compared to reality. This was a very interesting topic to read. It made me really think about if I personally would be able to be thrown into a new environment and be able to learn without prior knowledge of the subject. I do think that one can be thrown into certain scenarios and learn how to solve the problem using the resources around them or provided for them but, I also think that this would depend on the complexity of the scenario. Even if someone is provided with resources to help guide them, do you think that this can still be applied if the scenario is more complex? When I look at it from the perspective of every person having different learning approaches then I start to think that the idea of throwing someone into a scenario without knowledge can only be applied in certain situation. Some learners might need someone physically in front of them doing the task or explaining it before understanding how to solve their problem or truly understand what they are learning. You’ll find my (not always positive!) opinion about narration in Do we really need narration?. Basically, research suggests that, for adults, narration is useful if it’s used to explain a complex graphic or in other limited situations. Otherwise, it keeps learners from moving at their own pace. If someone argues that “audio learners” need narration, you might be interested in How to respond to learning style believers. Brilliant, Cathy, it’s so good to see your concrete examples supporting the scenario style of learning. I have just proposed a scenario style learning programme into a ‘content’ environment and will find out the initial response tomorrow.